Irishman Hugh Barton bought Château Langoa in 1821. It was classified a third growth at the time of the 1855 classification. In 1929 Ronald Barton inherited the chateau and in 1983 handed the property over to Anthony Barton who still runs the property. Stablemate of Château Léoville-Barton, whose wine is made in the same cellars. 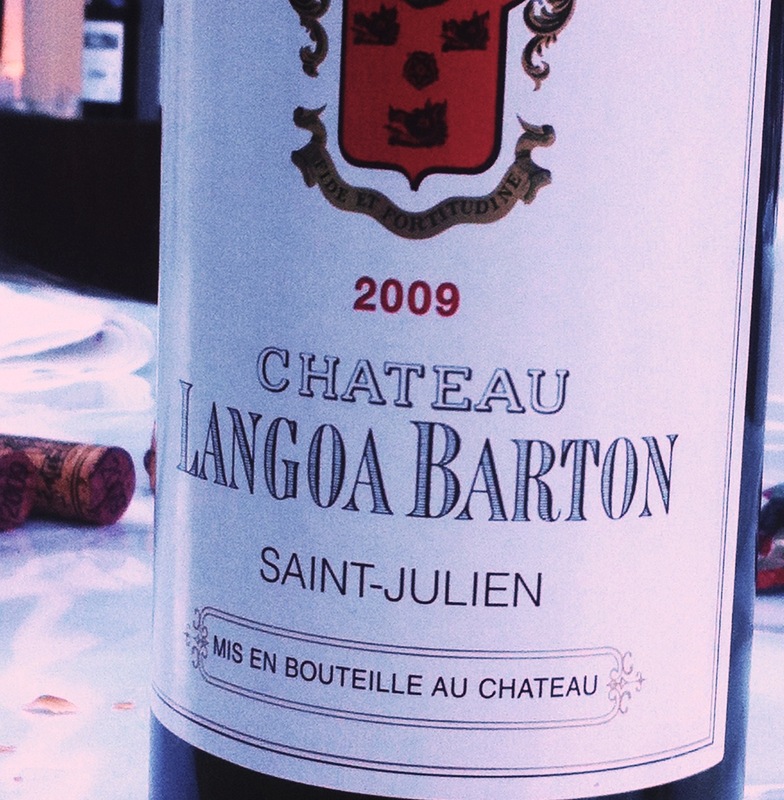 Château Langoa Barton is impeccably made though it can be a touch austere with quite drying tannins in some vintages. Certainly it is a very serious wine with good purity. The 2009 is an extraordinary effort and the best wine I’ve yet had from Langoa. 2011 here was successful for the vintage too. Vineyard/Terroir: 18 hectares with gravel on clay subsoil planted with 70% Cabernet Sauvignon, 26% Merlot and 4% Cabernet Franc. Winemaking/Elevage: Fermented in temperature-controlled wooden vats followed by twenty months ageing in oak barrels, 50% of which are new. 2010 Deep and dark at the centre; stalky fresh blackcurrants and ink; tight but layers and opens up in the glass; very clean and very pure; impressive; blackcurrant fruit tones domnate the palate; solid but clean and crisp; very good stuff. Drink 2018-2035. 93+ MW Institute Nov ’14 [Earlier note] Deep and saturated look; fresh; some blackcurrant and dark cherry notes; pure again; similar to Léoville Barton obviously but a notch down in volume; some spice; very classic; blackcurrants and leaf; some undergrowth; grippy and structured palate; lots of extract, tannin and acid. Quite a mouthful at present. Also needs ten years plus. 91+ UGC Oct ’12 [Earlier] Very dense; ripe and creamy, cassis, blackcurrant notes; saturated with aroma; impressive nose, layers; good attack, intense but some flesh; good grip and tannin ripe. Dry, grippy finish. Length. Pretty good. 89-91+/100 Tasted 5 April 2011. [Second tasting at UGC] Very big and dense looking; vibrant, silky and attractive note; fresh blackcurrant and cassis; quite excellent on the nose. Very clean and precise. Dense, concentrated palate, tannins here and a hardness. Will need ten years. Good length, grip and chew at the back. Not seemingly as extraordinary as 2009, more classical, tannic and strong. 89-91/100 Tasted 7 April 2011 at UGC. 2009 Mid depth; stones, blackcurrants and cassis on the nose; layers of blackcurrant fruit here; sturdy and fresh but full of fruit; nicely balanced and appetizing freshness. Clean and fresh in a [relatively] tauter style than some but that restraint is appealing. Drink 2017-2030. 93+ MW Institute Nov ’13 [Earlier note] Deep, dark and inky looking; lovely seductive nose of blackcurrant fruit, earth and freshness; these Barton wines are now coming into their own – and Langoa is every bit as impressive as it was during the primeur tastings; real density, mineral tones; crushed rocks and pure blackcurrant fruit; chewy and structured it will need time but such wonderful blackcurrant fruit. Knockout St Julien and knocking on the door of sibling Leoville-Barton. 95+/100 UGC Oct ’11 [Earlier] Vibrant colour; ripe and very attractive nose; very perfumed with red fruits and concentrated – lovely layers here; quite pretty; roses and red fruits; very correct for St Julien; lovely layered palate with good fruit; tannic but ripe with intensity; extract and tannins here but excellent overall. A structured wine. Will age very well. The blend is 54% Cabernet Sauvignon, 34% Merlot, 12% Cabernet Franc. The best Langoa I’ve had. 92-93+/100. Tasted 30th March & 1st April ’10 UGC Primeur tasting. 2008 Mid depth; blackcurrant pruity; quite fresh; palate quite compact and firm in acid; chewy and tight. Drink now – 2025 88+ MW Institute Nov ’12 [Earlier] Deep red black with purple hue, ripe muscular style; blackcurrants; cassis; quite serious; pretty full across the palate, no dips; softer, rounder tannin than I expected; well integrated. Intense and with good length. Very good 90+/100 UGC Oct ’10. 2006 Again good depth here, deep and intense looking; coming after big brother a bit difficult but minerals and stones here alongside the blackcurrants; resin and intensity here but this is very good – deep and intense but also fresh. Some tobacco creeping in. Lots of cassis and blackcurrants here. Palate concentrated and fresh with excellent intensity and grip and structure. There is sufficient flesh here and the tannins, while a little dry, should work out. Overall good guts and extract on the palate rich in fruit with lots of cassis and blackcurrant flavour. Really quite rich. Excellent length too. Langoa has showed extremely well in the past four vintages with little of the estate’s [former] benchmark austerity. This is hot on Leoville Barton’s heels. Drink now-2028. 92+/100 MW Institute Nov ’10.